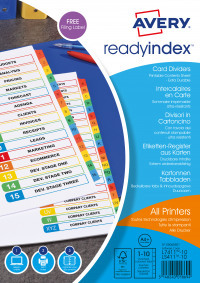 • Colour-coded dividers with printable contents sheets. • Customisable with Avery FREE templates and software. • Extra strong reinforced punched holes and laminated tabs for extra durability. • Suitable for laser and inkjet printers. • FSC certified card material from well managed forests and recyclable as part of paper waste. • A4+ Extra wide for use with A4 punched pockets, leaving tabs in full view. If you want to add a professional and eye catching index to a presentation or proposal, then the Avery Multi-Colour Extra Wide 1-10 Ready Index is the perfect product for you. With a colour co-ordinated index, dividing up documents into sub-headings has never been easier or more stylish. Any index you create will be able to resist wear and tear being made from the very best materials to show you can work to the very highest quality.